I recently heard a story told to children which has raised in my mind a question about how to draw the line between truth and non-truth. Since science is a quest after truth, to encounter blurriness in this line is confusing to me as a science educator. In the story, Christopher Columbus has gone to his funding agency, the King and Queen of Spain, to ask for funding for a second expedition to the new world. He is using an egg as a visual aid, as a physical model of the globe, to demonstrate his strategy of sailing west rather than east to reach the Indies. One of the attendant nobles calls into question Columbus' accomplishment, saying that it is obvious that one could go around the globe to the west to reach a destination to the east, that anyone could have thought of this. Columbus says, well maybe so, or maybe not. He then takes the egg, and asks if any of the assembled company can balance the egg on its end without any kind of help or aid, as he can. Various nobles try to balance the egg on its end, and without exception the egg falls onto its side as soon as the supporting fingers are taken away. Columbus then picks up the egg, taps its end on the table to break the shell, and leaves the egg standing on its end. "So you see," he says, "once I have shown you how to do it, it is easy, and indeed anyone can do what I have done. But before I showed the way to do it, it was not easy or obvious at all." "Once you see the secret," he continues, "it is obvious how to do it, and you will always remember it. But before you see the trick, it is not at all obvious. And so it was with sailing west to come to the East." Historians say that this story is apocryphal. In other words it didn't happen; it is untrue. And yet, it contains an important germ of truth. In science education and other fields this sequence of events is familiar: (a) many people find something difficult or impossible to see, understand or figure out; then (b) they see "the trick" revealed, and then (c) it seems obvious. It's hard to even remember what the world felt like before one learned the secret trick. In education, such an insight is sometimes called a "threshold concept" (Mayer & Land, 2003). The term is used to describe a concept or insight that is transformative: after passing through the threshold, one sees things differently than before, especially relationships that were previously unseen. The passage is irreversible; once through the threshold, one doesn't forget and can't "unlearn" the knowledge. An expert practitioner on the far side of the threshold may find it hard to recall how the world used to look, and thus find it hard to understand the difficulties faced from the untransformed student perspective. Finding one's way through the threshold tends to be difficult, especially without a guide. Examples of threshold concepts include heat transfer in physics, opportunity cost in economics, complex numbers in mathematics, and deep time in geology. For the people of Columbus' time, the roundness of the Earth was a threshold concept. For generations, most people failed to find their way to this understanding. Once the threshold was breached, relationships became apparent, for example, that one could sail west to reach a destination in the East. Once the "secret" was well known, it became difficult for modern Earthlings to imagine what it would feel like to think that the Earth was flat. The story of Columbus egg shows us the deep truth that human learning is subject to threshold concepts. I wrote in an earlier post about "Telling Lies to Children," offering sciencey explanations that were simplified to the point of untruth. Columbus' Egg appears to be a different variant of telling lies to children. As in the previous post, I find myself concluding that this can be OK, that the larger, deeper truth of the parable can outweigh the smaller surficial untruth. Columbus' Egg: I heard the story of Columbus' egg told by student minister Lisa Perry-Wood as the Message for All Ages at the First Religious Society of Carlisle (Unitarian Universalist). Wikipedia has a version of the story here, which includes a evocative 1752 engraving by the artist William Hogarth. 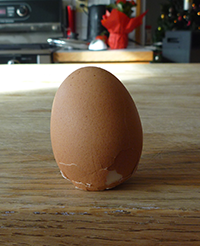 The trick is easier with a hard-boiled egg, which is what I used for the photo, but supposedly works with a raw egg if done with appropriate care and practice. Threshold Concepts: The original paper on threshold concepts appears to be Meyer, J., & Land, R. (2003). Threshold concepts and troublesome knowledge: Linkages to ways of thinking and practicing with the discipline, Occasional Report of the Enhancing Teaching-Learning Environments in Undergraduate Courses Project. Edinburgh: University of Edinburgh, School of Education. There was a conference on Threshold Concepts in Geosciences in 2008, which identified deep time, spatial literacy, density, and erosion as candidate threshold concepts. Some of the findings from the conference were published in Stokes, A., King, H., & Libarkin, J. C. (2007). Research in Science Education: Threshold Concepts. Journal of Geoscience Education, 55(5), 434-438. "My baptism in field paleontology came from walking out in the Arizona desert…At first, the whole enterprise seemed utterly random…I'd set off looking for fossils, systematically inspecting every rock I saw for a scrap of bone at the surface. At the end of each day we would come home to show off the goodies we found. Chuck would have a bag of bones…And I had nothing, my empty bag a sad reminder of how much I had to learn. After a few weeks of this, I decided it would be a good idea to walk with Chuck. He seemed to have the fullest bags each day, so why not take some cues from an expert? Chuck did not look at every rock, and when he chose one to look at, for the life of me I couldn't figure out why…Chuck and I would look at the same patch of ground. I saw nothing but rock--barren desert floor. Chuck saw fossil teeth, jaws and even chunks of skull…I wanted him to describe exactly how to find bones. Over and over he told me to look for "something different". ..Finally, one day, I saw my first piece of tooth glistening in the desert sun. The enamel had a sheen that no other rock had…The difference was this time I finally saw it, saw the distinction between rock and bone. All of a sudden, the desert floor exploded with bone; where once I had seen only rock, now I was seeing little bits and pieces of fossil everywhere, as if I were wearing a special new pair of glasses… Now that I could finally see bones for myself, what once seemed a haphazard group effort started to look decidedly ordered. Over time, I began to learn the visual cues for other kinds of bones…Once you see these things you never lose the ability to find them…a fossil finder uses a catalogue of search images that make fossils seem to jump out from the rocks The power of those moments was something I'll never forget. Here, cracking rocks in the dirt, I was discovering objects that could change the way people think. That juxtaposition between the most child-like, even humbling, activities and one of the great human intellectual aspirations has never been lost on me." If you are regard any window10 related help to visit this website http://gethelpwindows10.com . because this is the best information are provided by this website. if you are not to conform the use of this website to learn and complete the working. this is true. i hope you have join.